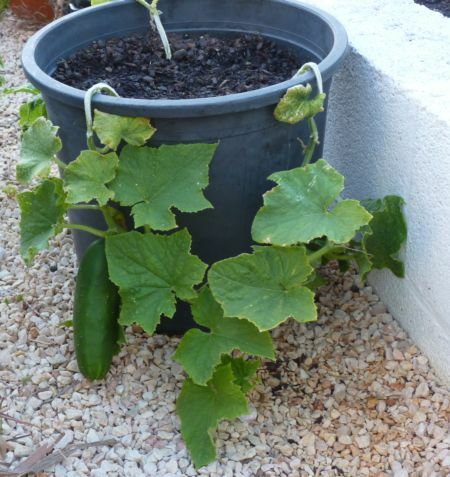 One of my many ‘container’ gardening successes is growing cucumbers in pots. Rather than plant seeds and wait weeks for them to germinate I buy the seedling plugs from local markets. The only downside is that there are no “fancy” varieties to choose from, or perhaps I should view that as an upside because the plants they sell are hardy and more suited to the climate of the local area. If the veteran Portuguese gardeners are buying them for their hortas, then the varieties are good enough for me. 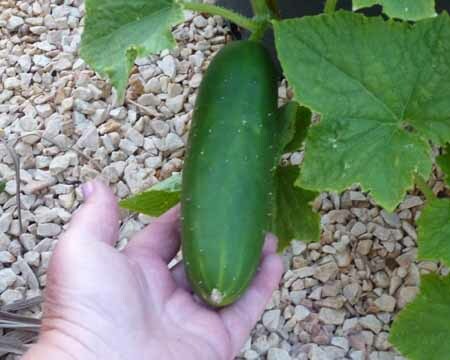 When to plant: Cucumber plants are available in the Algarve from January onwards although this year I never planted any until March and then not again until May. Containers: I use a 12x12inch plant pots planting three plants per pot. Soil: I use a good quality general purpose compost which I mix with sandy soil. Three parts compost to one part soil. Feed: Once the flowers have formed I feed weekly with MiracleGro or liquid manure which I make from soaking Alpaca or horse manure. Watering: Water daily and don’t let the soil dry out. I made that mistake and the baby cucumbers withered and died. Well done, they look really healthy. I’ve never tried them in pots, so I might give them a go. Home grown cucumbers are so much tastier than shop bought. Lovely!!! As I have no garden space available in the sun I grow them in exactly the same manner against a sunny wall away from people walking by. Same sized pots and also usually three to one container. I do not have time to fuss with seeds and always buy punnets of seedlings [what you call plugs] . . . we normally have about 6-8 different kinds suitable for containers at my local nursery . . . on line one can buy many more, including heritage kinds, but the postage etc makes it a wee too expensive. Good luck with yours – not that you need it 🙂 ! Now that’s a green thumb! My mother does this too because her garden is very small. She’s been very successful. This looks cracking…I am going to have a go, as I am the only one at the Ark’s spot that likes cucumbers.